I wish to write a short note about Trio Canig. As a Diplomat working in the Middle East, tact, decorum and talent is always a pre requisite when considering suitable musicians to entertain Ambassadors, Diplomats and the Ex Pat community. We recently had the privilege of listening to Trio Canig perform at the British Embassy Riyadh KSA. Their performance was exquisite as was their company throughout the duration of their stay with us in the Kingdom. I commend Trio Canig to you all. They are the missing piece in your puzzle, be it a Wedding, a celebration or an event that calls for the best. They are indeed flawless. 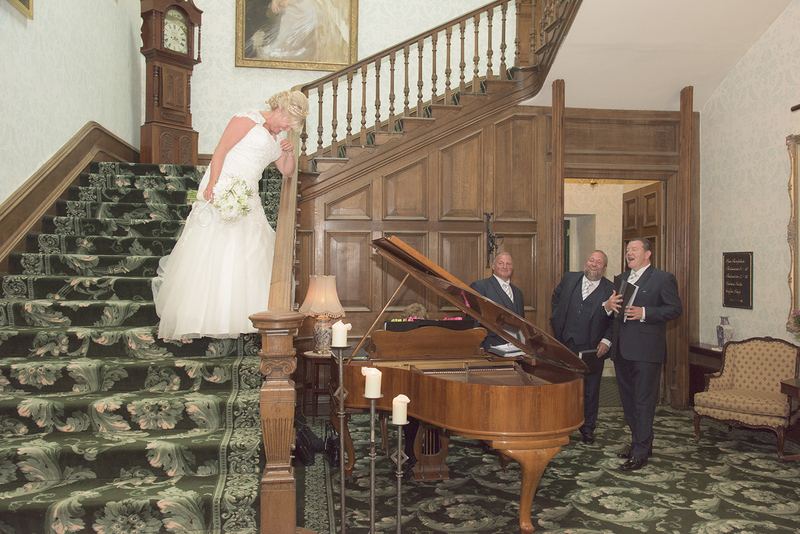 Trio Canig performed at our wedding on Sunday and were a true highlight of the day. We have had so many comments and messages about them. The videos online simply don’t do justice to them performing in real life. 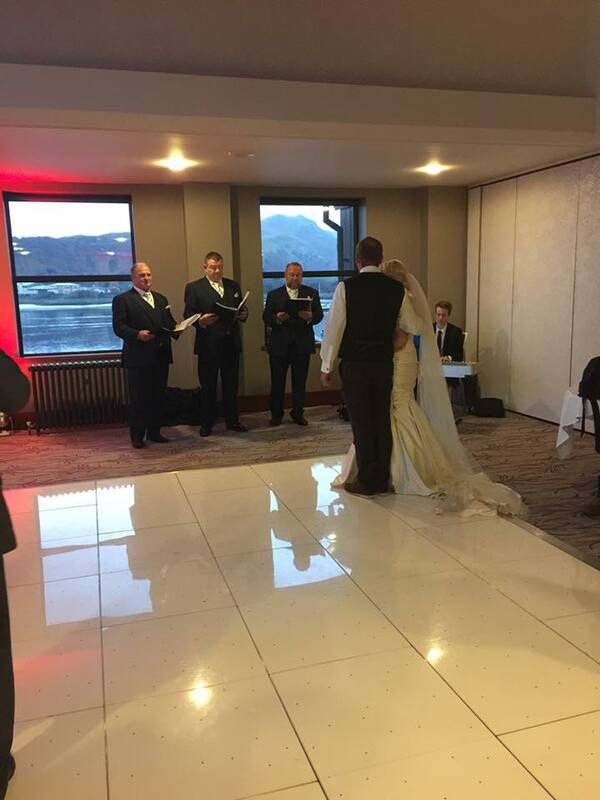 I walked down the aisle to our national anthem and everyone had goosebumps. It was such a spectacular performance. They went on to sing throughout the service, ending in what a wonderful world as we left the church, which was incredible. 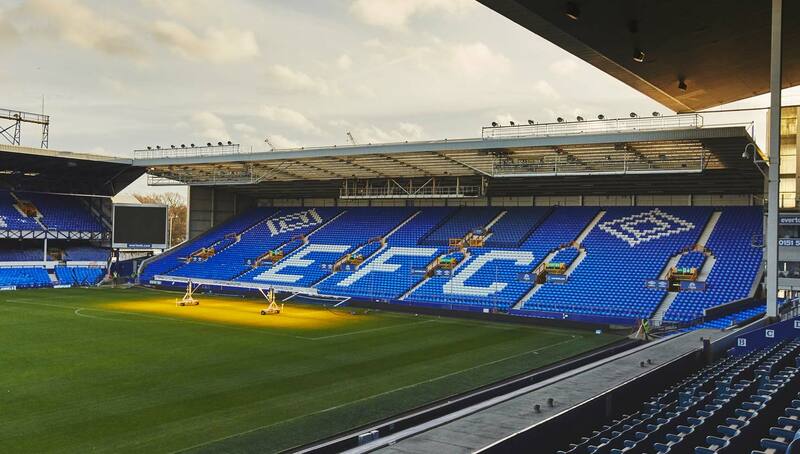 At our venue (Goodison Park) they learnt and sang one of our favourite Everton songs, much to the delight of our guests. From start to finish, they were a joy to communicate with. Always friendly, polite and professional. I was so sad not to spend more time with them on the day and I don’t even think I got a picture with them, which I am very sad about! Hopefully there will be one in the professional batch. 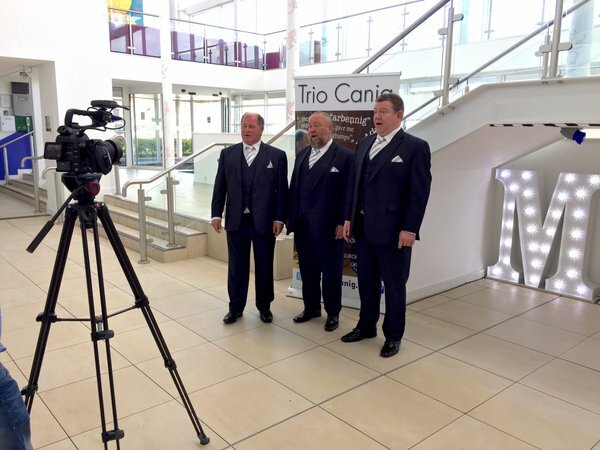 Thank you so much Trio Canig for making our day extra special! We couldn’t be happier with our choice in booking you! We would like to thank you from the bottom of our hearts for making our day even more special. From the moment you started singing, our guests started commenting about how amazing you were and how they had never heard voices like it. You men really are so talented. 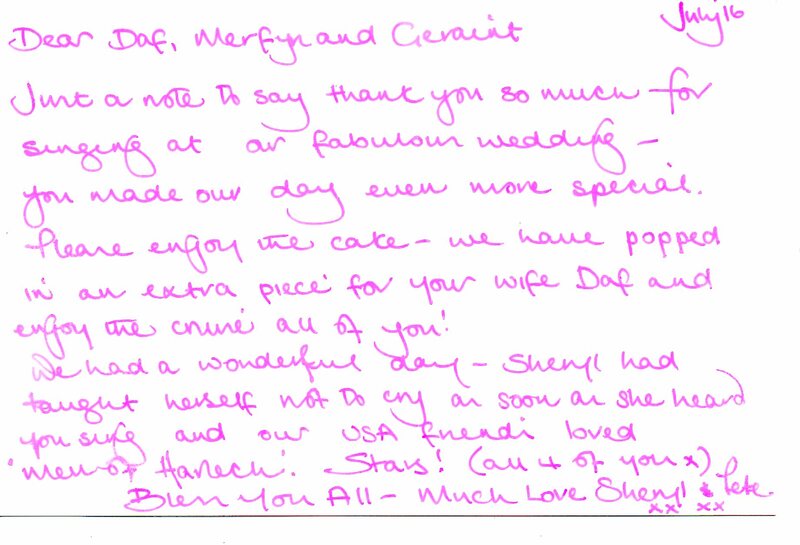 Ashley made sure we thanked you in our speeches at our wedding breakfast, as you really did make our day so special. We really can’t speak any more highly of you and we will be recommending you at any given opportunity! We had lots of people asking who the amazing singers were at our wedding, for anyone who wanted to know it was Canig Trio. After returning from honeymoon last night on behalf of both of us, a massive thank you to all at Canig Trio, you were absolutely amazing. Everyone wanted to know about you and everyone had nothing but amazing things to say and we would recommend you guys to anyone! Thanks again! You were stunning. Your singing was so moving. I have never experienced anything quite like it. Feel privileged to have heard you sing. 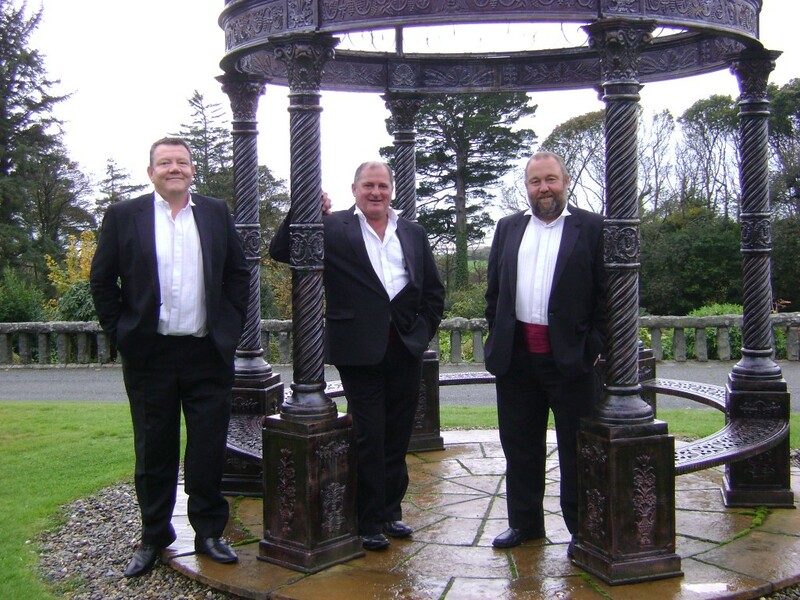 At last I have time to write all my letters/emails of thanks following our daughter’s wedding celebrations and Trio Canig are at the top of the list!! Many thanks for being such a special part of Bethan and Josh’s marriage service. I have received some wonderful letters of thanks from family and friends. 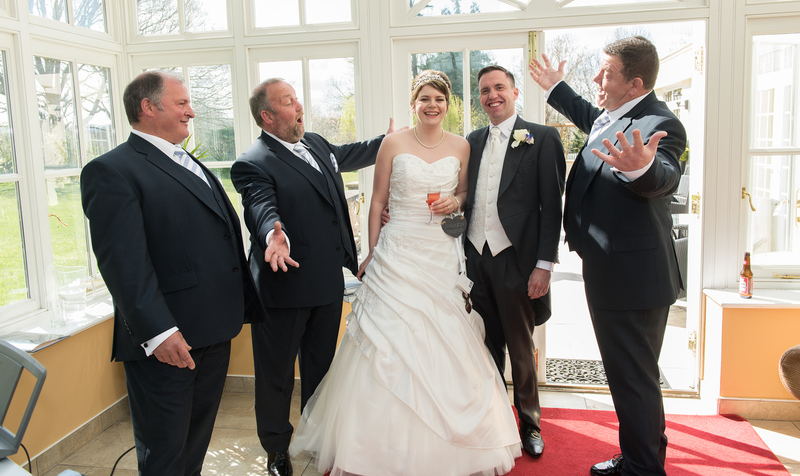 So many guests have given you a particular mention for making the service so memorable. Everyone enjoyed your ‘Welsh’ welcome to St Cyngars and loved your singing. What a pity our immediate family missed so much of your wonderful performance! 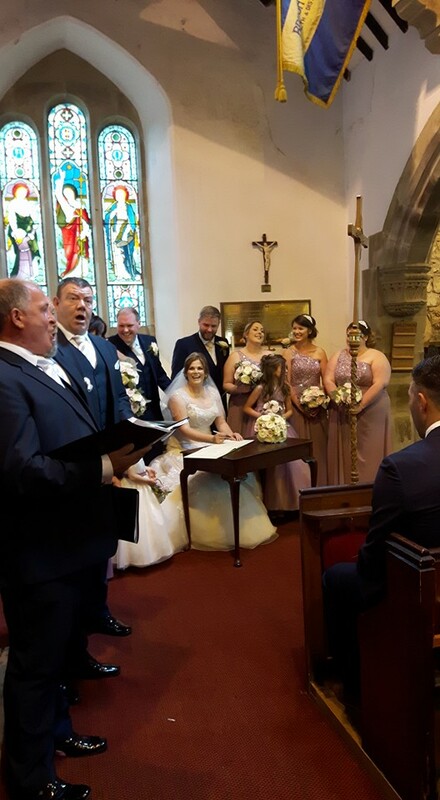 We would not hesitate to recommend you to others and hopefully will be able to welcome you back to St Cyngars when and if our other daughter gets married! We just got back from our honeymoon yesterday but wanted to get in touch to thank you so much for making our day so extra special. It was magical and very moving, you really set the scene. It truly was beautiful. Walking down the aisle as you sung hallelujah was amazing. All our family and friends have commented on how much they enjoyed listening to you and how much emotion and joy you created. I was so moved when you sung to us as we arrived at the venue making a special performance for myself and Chris. I felt so emotional and can’t tell you how much it meant to us. Thank you also for singing our three songs which we carefully selected for our special day. We would definitely recommend you to others. Please feel free to use this on your page. Please pass on our thanks from my mother and myself to all of you that made up the Trio. It was a great success from start to finish. I am sure not many people in the congregation will have heard anything so moving. You played a huge part in Victoria’s and Ben’s wedding along with Reverend Crook who came out of retirement to do the service because he knew Victoria as a baby, to have the service in such a stunning and historic church contributed to a day that I think could not be bettered. We hope you arrived back home safe and sound, and look forward to hearing you again sometime. All the best for 2016. Diolch yn fawr iawn i chi am fod yn rhan o’n diwrnod arbennig! Dwi mor falch ein bod ni wedi eich gweld chi yn y wedding fayre ym Mangor ac yna wedi llwyddo eich archebu! Roedd yr awyrgylch yn yr eglwys yn fendigedig! Mae sawl wedi eich canmol! 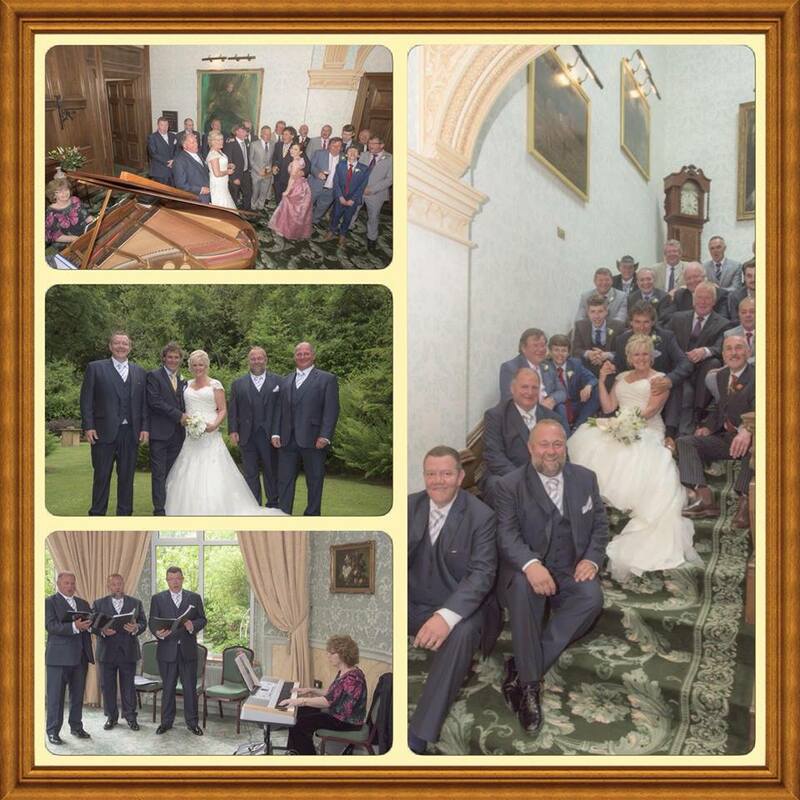 Mi fyddaf yn pleidleisio amdanoch yn y welsh national wedding awards cyn mynd i ffwrdd ar y mis mel! Diolch unwaith eto! Diolch yn fawr iawn am ganu yn briodas fy chwaer ddoe Caryl Ellis Hughes a Gareth Owen. Mi oedd a chi yn wych!! Mi oedd yr awyrgylch yn yr Eglwys yn gret. Diolch eto! Will never be able to watch Lion King again without thinking bout Veron and Luke’s special day!! Have to say Trio Canig sang it better then Elton John. We would just like to thank you for everything you did on Saturday on our special day. You sounded amazing at the church and at Bron Eifion. 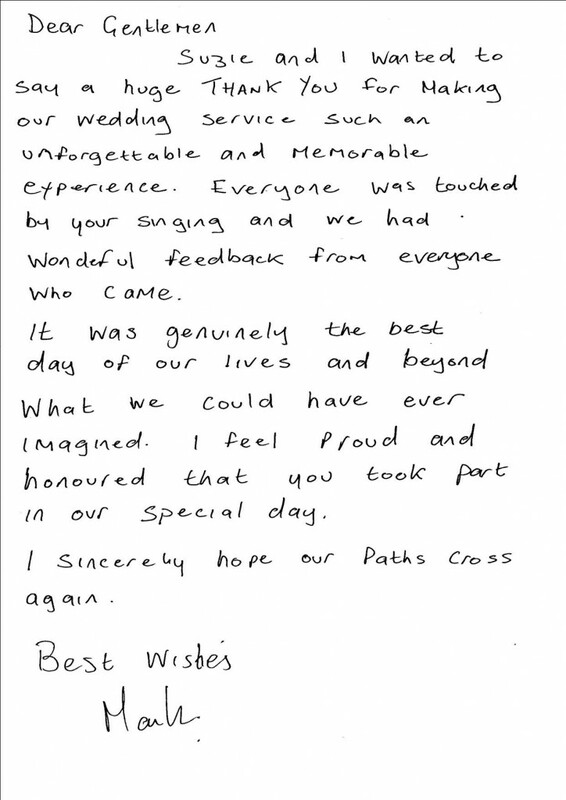 All of our guests commented on how fantastic you were. Many thanks again, and sorry we missed you to say goodbye on Saturday. We have had many comments, all positive, about your performances. Everyone thoroughly enjoyed your singing, and Rachel cried at the sound of your voices when she walked into the Wynne room. Thank you for adding your magic to our day. We’ll certainly be recommending you wherever and whenever we can. And if you ever do a concert or public performance we’ll certainly be in the audience! 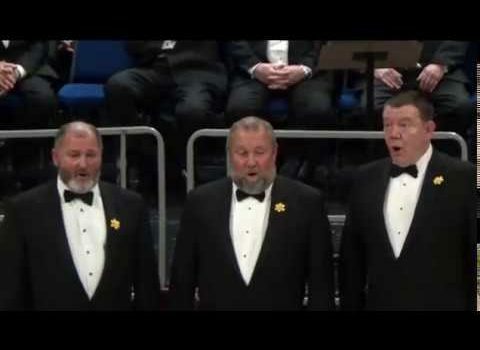 Diolch Trio Canig you made a beautiful occasion AMAZING you touched the hearts of the males and ALL us girlies cried happy tears but wow you were fantastic. My wife booked Trio Canig as a surprise for me and my Welsh family. Closer to the Wedding, my wife couldn’t keep the secret any longer and told me about the surprised. I liaised with Dafydd from the group about song choices and the arrangements. He made everything so easy, they even agreed to perform a song they weren’t used to performing. They liaised with the verger of the church and the hotel where we held our reception, they were flexible with timings and were at the venue well in advance for practice. 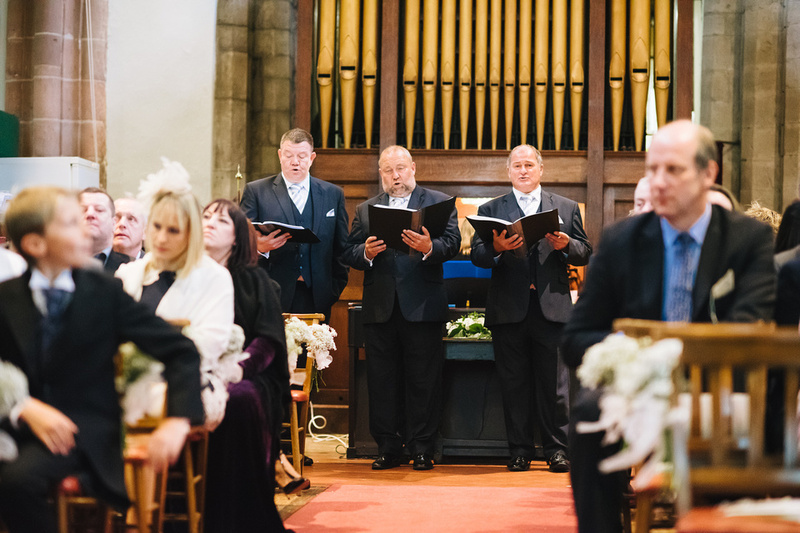 My wife was late to the church as expected and Trio Canig did a great job in planning the gap with appropriate songs and hymns in numerous languages, they were good enough to lend me some moral support as my nerves became ever more apparent. 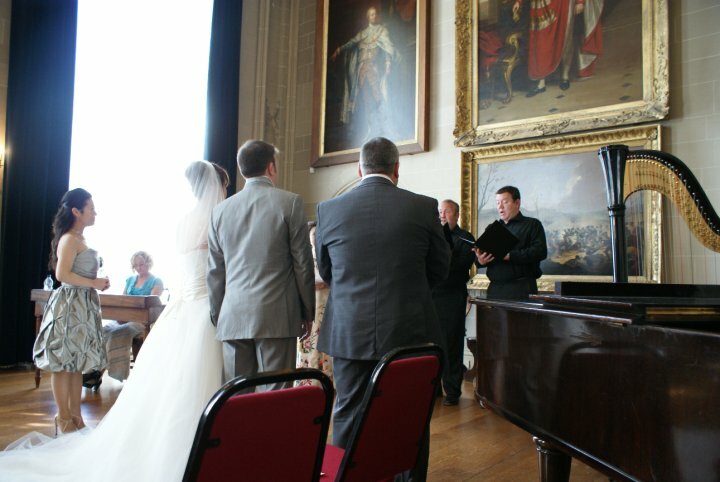 They sang during gaps in the service and then moved on to the reception venue. They were the prime focus of attention at the venue, keeping the tone and volume to an appropriate level, interacted with our guests and delivered on all our song requests. Our guests, my family especially were so impressed and continue to speak of them now several weeks after the wedding. We really couldn’t recommend these guys enough, we only wish we could have another such occasion to book them again. Just want to send a ‘million’ thanks to you all as a team, for the superb performance on Saturday, everything was perfect. 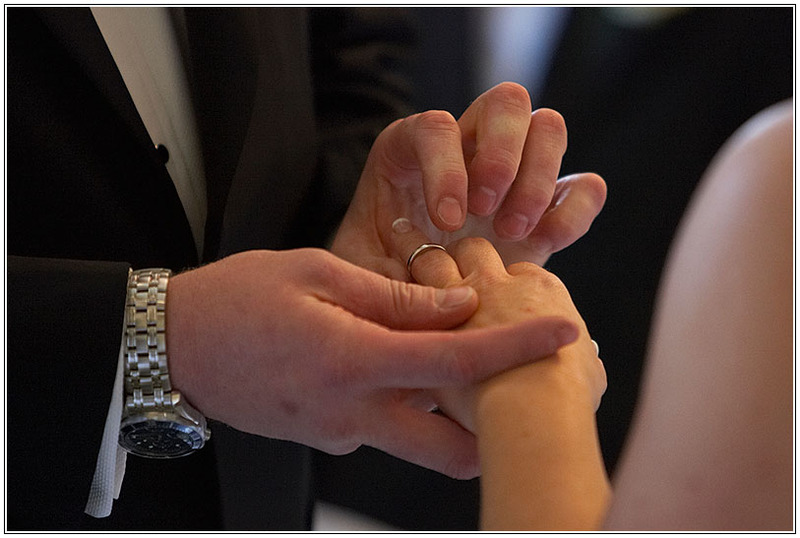 We have not stopped talking about it since and it was so well worth keeping you as a surprise because it blew everyone away and fuelled the emotions of the day. I think every single person in that church must have spoken to us since and said how wonderful and special you made the day for us all and I am so glad we decided to have a videographer for the day. It now means that Emily, Danny and the rest of us who arrived later at church can enjoy the full performance again and again. I can’t wait to see it. Also, thanks for taking the trouble to ‘colour co-ordinate’ with the cerise theme, that was so considerate of you and didn’t go unnoticed !! I could go on and on and on ……… sorry ! We are so happy. 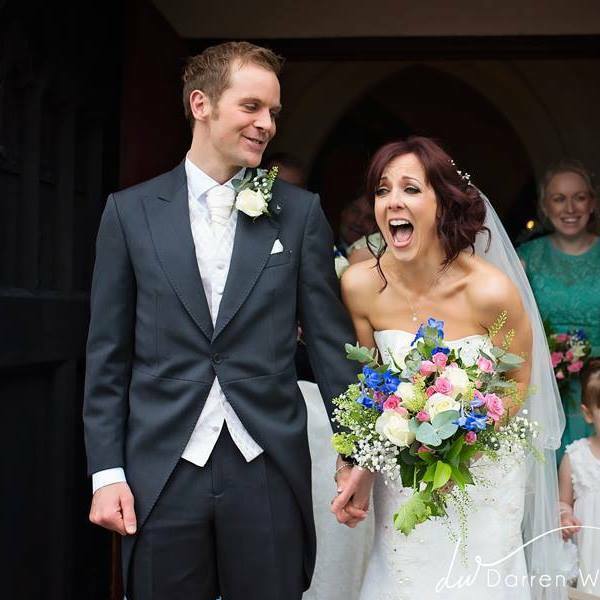 I’m sure Emily and Danny will also be inputting but want to thank you again for all your attention through the planning of this fabulous day and if there is anything we can help you with, please don’t hesitate to contact us. It was a stunning unexpected performance……..absolutely brilliant and one more wonderful thing on a truly wonderful day. Boys you rock! 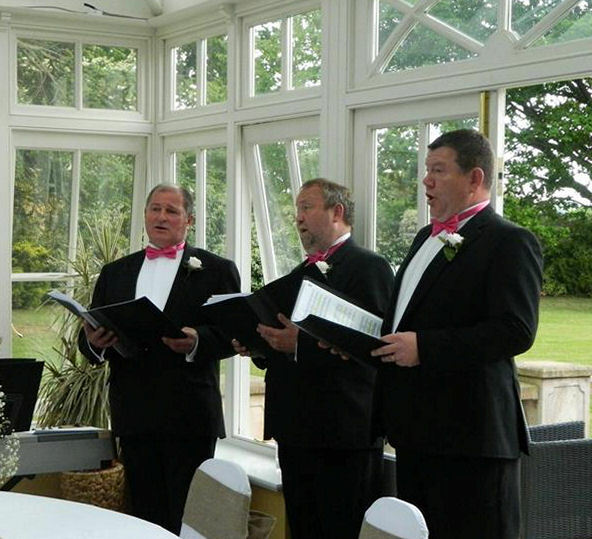 With 5 daughters we have had the opportunity of inviting different groups to sing at their respective weddings… Trio Canig have been by far the most memorable. They brought tears of joy and happiness both at the ceremony and whenever it has been subsequently recalled; making the happy event truly special. We wish the trio every success in the future to enable others to experience their unique and remarkable talent. 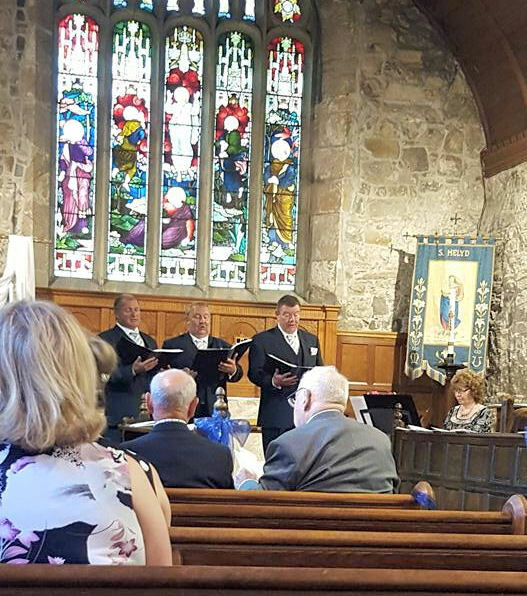 I would like to say a BIG thank you to Trio Canig for performing so beautifully at the church yesterday and for learning a song especially for me to walk down the aisle to. Sorry we didn’t get chance to thank you face to face after the service, we were whisked away for photos, but everyone was telling us all day how great you were and you really helped to make the service more personal and special. 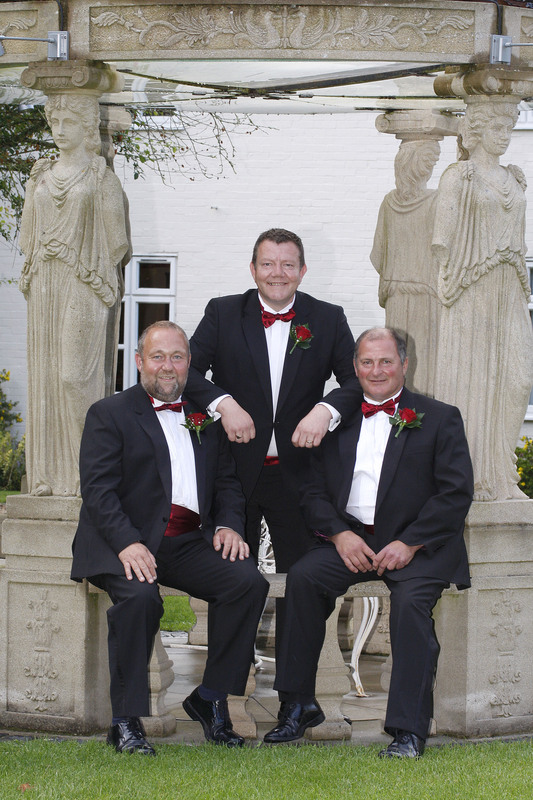 Trio Canig sang at our wedding in August. They were wonderful and made our day very special. They sang The Rose as part of our ceremony, it was beautiful. They also sang other songs throughout the day. Our friends are still talking about how special they made our wedding. 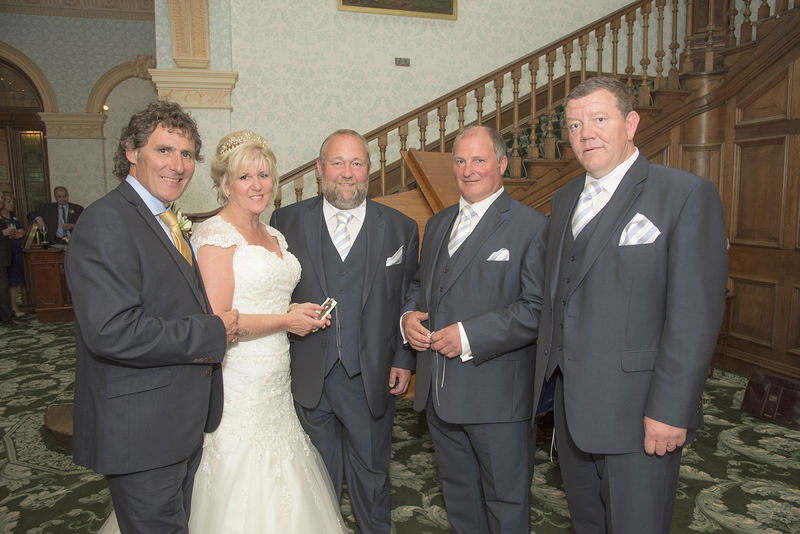 They couldn’t have been more helpful with planning and organising of the day…Many thanks to them all. Kindest and best regards. We just wanted to pass on our thanks for your performance on saturday. Despite the tropical conditions! We were both thrilled with how the day went and you were a big part of that. The two songs we asked you to learn sounded amazing as well and we really appreciated it. 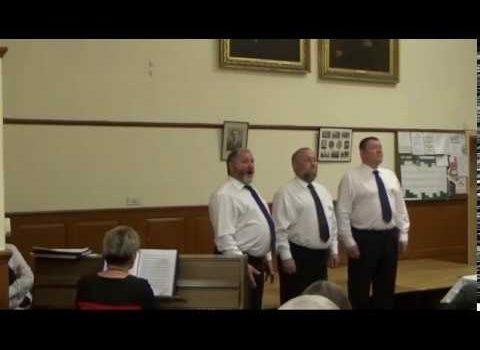 Everybody was very complementary about you afterwards – we thought your sound really suited the room and was much more in keeping than a bigger choir would have been – hopefully you’ll get some more bookings there! Thanks you very much for your performance at our event, it was just what we had hoped for and more. Especially Delilah towards the end and getting everyone to join in! We hold this event annually and have different entertainment and venues every year but we had some of our clients telling us that this was the best year yet and one gentleman said it was the best night out he and his wife have had for years! I can only say that when I listened to your God sent beautiful voices – I cried – I was overwhelmed, and you’re just what I’ve been looking for (and praying for) – the voices of a thousand angels – packed into a compact choir of three! (certainly easier to fit into a studio!) I’m looking forward very much to the honour of performing live together and meeting up with you all soon! Diolch yn fawr iawn for the wonderful performance at the above the other evening, it really made the event. I will recommend you to all my friends who may be looking for something really different for their event. This trio made our day so special. Everyone was blown away by the quality of their voices and harmony. I would recommend them to anyone who wants to enhance their wedding day as our guests are still talking about their performance. Brilliant, thanks lads.
. . . I love how they all look so relaxed….like they were having a chat together and one guy just starts belting out a song, and the others just chime in. I like to describe performances like this in two words: natural music. Truly beautiful. Btw, MAAAAAJOR chills !!! Almost fell out my chair!!!!
. 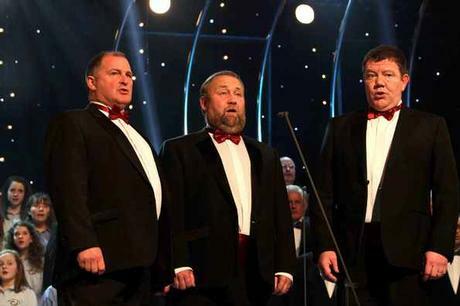 . . these are real men of the earth no Britain’s got talent no c**p just real men singing a real song. God bless these real men . . These lads have what it takes to transport you to a place away from your worries and concerns…….if you’ve had a ‘ bad day ‘ or are wishing ‘ I’d like to be somewhere else other than here ‘ then their songs are your boarding pass,,,,,the flight will be tranquil and efficient…you’ll land wondering what it was that was troubling you so…..most of all, the flights are on demand. Dim ond gair bach i ddiolch yn fawr iawn i chi, Geraint a Merfyn ac am ein diddanu nos Wener ddiwethaf yng Ngwesty Bae Trearddur. 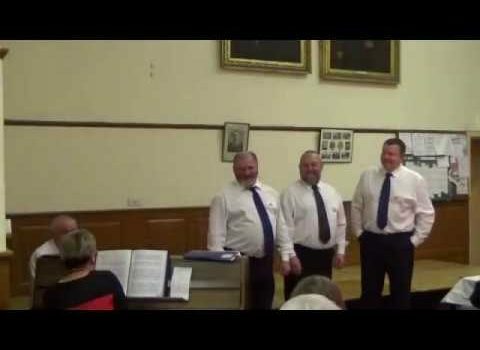 Cawsom berfformiad rhagorol ac ‘rwy’n siŵr fod llawer, fel finnau, wedi gwrando ar Danny Boy unwaith eto ar ‘You Tube’ dros y penwythnos! Llawer o ddiolch, a phob llwyddiant i chi yn y dyfodol. Diolch o galon iddych am gymeryd rhan, Roedd pawb yn brolio chi drwy’r dydd…..anhygoel 🙂 pawb wedi mwynhau gwrando arnoch. Roedd ‘Everything I do’ yn yr eglwys yn berffaith…..fedrai ddim diolch digon iddych am wneud ein diwrnod yn un bythgofiadwy. I cannot recommend Trio Canig highly enough. 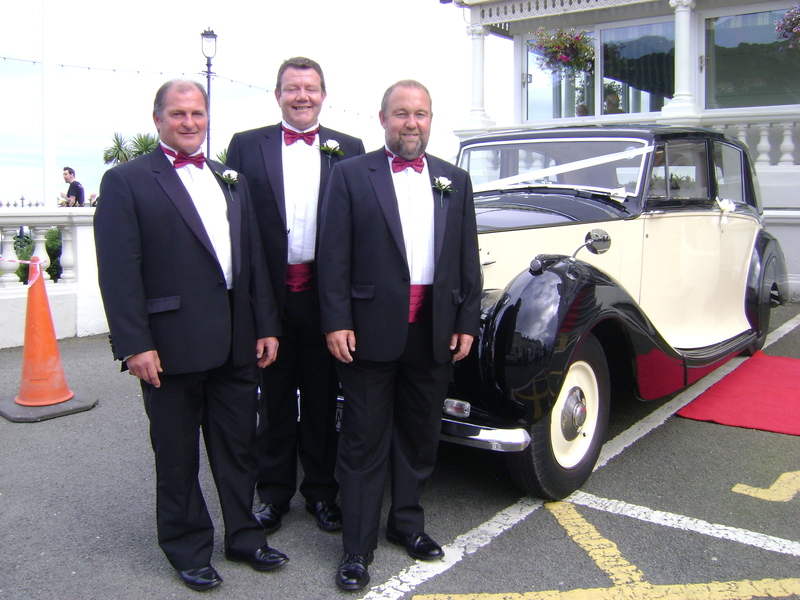 From the first moment of contact to their delivery of service at our wedding they were professional and helpful. 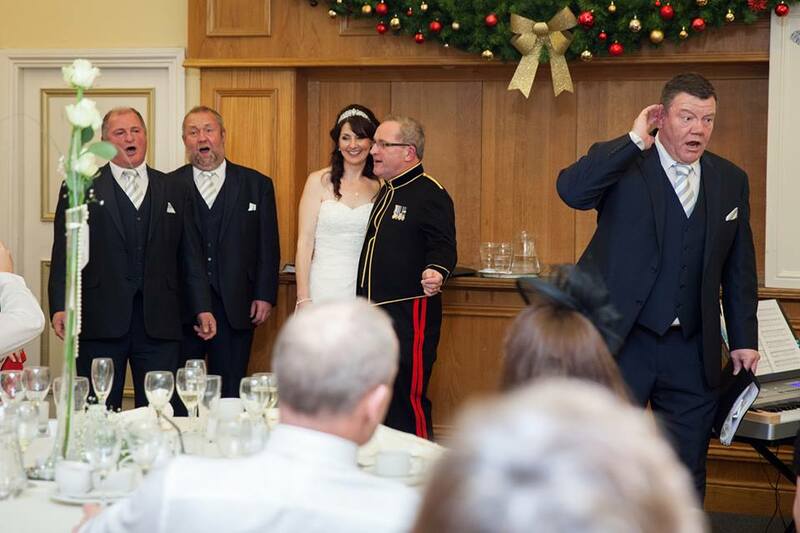 All our guests thoroughly enjoyed every second of their performance. 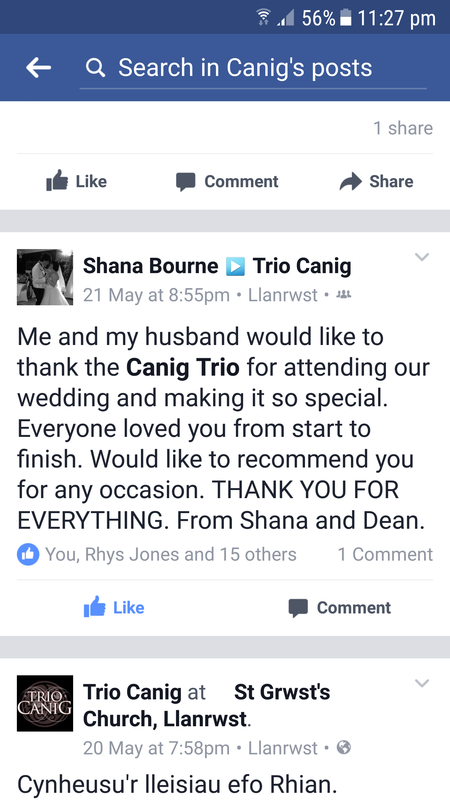 I personally cannot thank Trio Canig enough for making our wedding day because the reaction from my husband, as we had managed to keep their performance a secret, was beyond my expectation. Diolch yn fawr i chi am ganu gwerth chweil yn ein priodas. Bu i bawb mwynhau y canu yn fawr iawn. Jon yn dweud os da chi eisiau gwneud hi’n bedwarawd, codwch ffôn!!! Diolch am adael iddo ganu hefo chi – ychwanegiad gwych at ddiwrnod gwych. While I know my wife has left a message of thanks I too would like to express my thanks for what I understand was a memorable performance. Sadly as father of the bride I only heard your two anthems and your melodious support in the hymns but so many people sang your praises at the reception your ears should have been burning all the way home. What a wonderful way to start what was a very memorable day for my family. Please pass my sincere thanks to your colleagues for their unforgettable contribution to our big day. 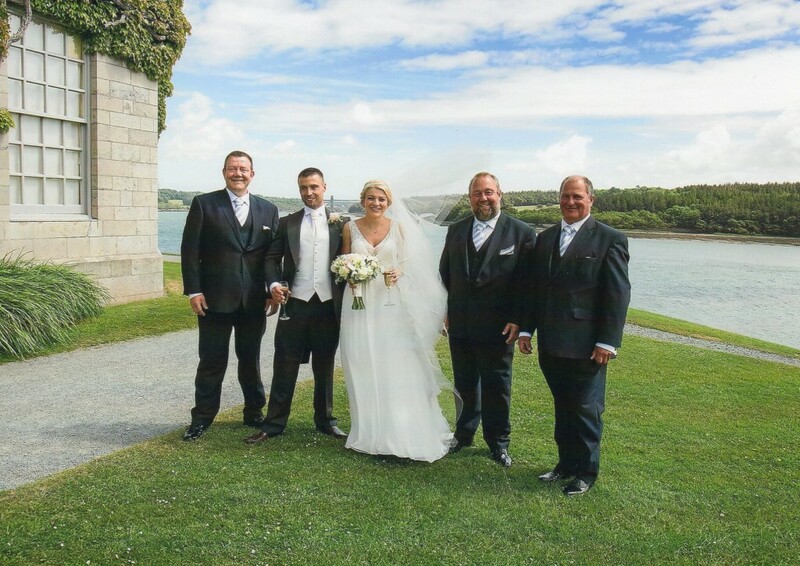 I would just like to say a massive Thank You to you all for being part of our wedding yesterday. You were fantastic. You really did blow people away. Can’t wait to see our video so I can see more of your singing. Thank you so so much. You really did help make our day perfect. Thank you. I would most definitely recommend Trio Canig to a friend, especially a bride to be… They made our wedding day one to remember forever. 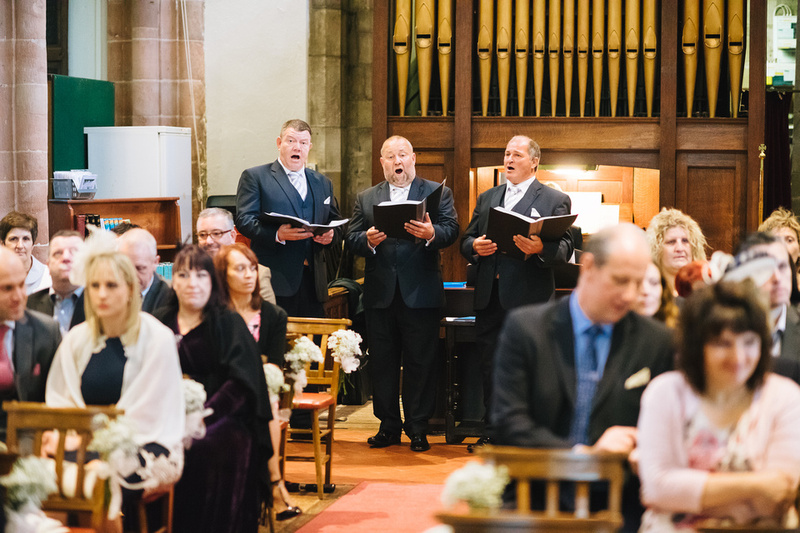 Their magnificent powerful voices filled the church with joy, everyone loved them, they also played at our wedding reception, very enjoyable and ever so professional. I asked for a few specific songs, ones they’d never done before and they performed them amazingly well, they’re very flexible… Highly recommended. Diolch o galon i chi am gymeryd rhan, Roedd pawb yn brolio chi drwy’r dydd…..anhygoel 🙂 pawb wedi mwynhau gwrando arnoch. Roedd ‘Everything I do’ yn yr eglwys yn berffaith…..fedrai ddim diolch digon i chi am wneud ein diwrnod yn un bythgofiadwy. Just wanted to send you a quick email to thank you for such an amazing performance and making our day even more special. Every guest commented how fantastic you were… We even had people crying before the ceremony – well done! I just wanted to follow-up to thank you again for sending out the CDs so quickly during the busy holiday season. It was greatly appreciated. The only challenge now is trying to find the right word to describe Trio Canig’s music. Beautiful? Mesmerizing? Heavenly? Yes, the last one, I think Heavenly comes closest. That’s why I am starting to wonder if you gents are really Welshmen or actually angels in disguise. Either way, what a blessing to listen to the three of you sing together!